Lowell Brewing Co.: Happy Holidays! Happy Holidays, everyone! I hope you all have a great next couple of weeks. I got a Christmas present in the mail yesterday. OK, so I ordered it six months ago and it just happened to show up before Christmas...well planned. Lowell Brewing Co. has now doubled its fermenting capacity to a whopping 20 gallons or 2/3 bbl with the additional fermentor! This will allow me to have two beers fermenting at the same time. 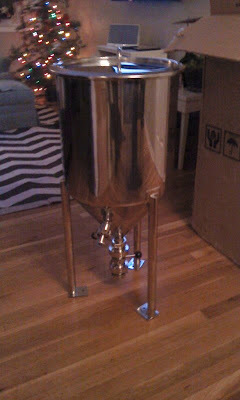 I also have another project coming up regarding a new keezer that maybe I won't reveal until it is complete. Thanks, Micah and Jeff, for helping me out with some of the wood working! I will be kegging the 4th batch of Busted Wing IPA tomorrow. It varies slightly from the previous batches as it has a little more hop flavor and is more heavily dry-hopped. Should be tasty. I also threw Muddy Huddy into the ring for the annual Mountain Sun brewpub Stout Month competition. If it wins, a 6 bbl batch will be brewed and served at all three locations...pretty cool! I'm not holding my breath though. I'm trying to finish all of these projects in the next month and get things in order so I can free up some time for the new addition to our family in March! I know I don't usually go into topics outside of brewing, but I have a lot to be thankful for in this past year. First and foremost, my amazing wife, Sally and the upcoming arrival of our first kiddo. I couldn't be more excited and truly in awe with the whole experience, notably the strength and loving nature of Sally. I have also realized how lucky I am to have the family that I do and how important every single one of them are to me. So, on that note, have a great holiday and I'll check back very soon. Treat yourself to well-made, craft beers this holiday season and appreciate what you have in life while you sip!